It was not quite the blowout we all thought was possible but at the end of the day there should be no room for complaints. The Seahawks took care of business as expected on Sunday, defeating the Cleveland Browns 30-13. With the win the Seahawks improve to 9-5 and thanks in part to the New York Giants loss earlier in the day Seattle has clinched a playoff berth for the fourth consecutive season. Cleveland’s record falls to a dismal 3-11. Here now are some brief thoughts following today’s win. Wilson Stays Hot: For the fifth straight game quarterback Russell Wilson avoided throwing an interception. He finished his day 21/30 for 249 yards and 3 touchdowns before turning the reigns over to Tarvaris Jackson late in the game. In the last 5 weeks Wilson has thrown for 1,420 yards, 19 touchdowns, and no interceptions. Once again two of his touchdown tosses went to Doug Baldwin who continues his own hot streak of 10 touchdown receptions over the past 4 games. Last week I briefly talked about how Wilson’s performance is coming at the best time and with two more games before the playoffs this is a perfect time for this wave of momentum to continue. Unfortunately I believe the only thing that is keeping his name out of the MVP race is the Seahawks record. Wilson may be the quarterback opponents do not want to face the most, especially at this point in the season. The Upper Hand: Bryce Brown had the longest run of the game but he was not the more consistent running back. Christine Michael led all Seahawks running backs in carries with 16 and he made the most of his opportunities, rushing for 84 yards and a 5.3 yards per carry average. I had a feeling Michael would make the bigger impact because of his experience in our offensive system and his knowledge of the playbook. Ball security was something that also had me smiling, as neither Michael nor Brown coughed up the ball. Moving forward I expect Michael to be the Seahawks lead back and it would not surprise me to see Brown phased out of our game plan entirely for our final two regular season games. A Long Wait: When people think of what makes a game “ugly” the first thing that usually comes to mind is turnovers. I thought this game would be a perfect opportunity for the Legion of Boom to feast on multiple Cleveland mistakes. At least that was the assumption. Unfortunately it took 47 minutes and 43 seconds for the Seahawks to record their first and only takeaway of the game, an interception by cornerback Marcus Burley. With strong safety Kam Chancellor inactive Seattle’s defense was not at full strength. Nevertheless forcing only one Browns turnover was disappointing. My hope is that the defense just had an off game. Here is something to keep in mind going forward. The Seahawks have recorded multiple takeaways in only 6 of our 14 games. Going up against another conservative quarterback next week it may be hard to force turnovers yet again. Thoughts on Cleveland: On Sunday I could see Johnny Manziel’s potential playing out on the field. Unfortunately he will likely be one of only a handful of players that will continue their careers with the Browns in 2016. This franchise is once again in need of a complete overhaul. Mike Pettine is not a good fit to be the head coach of this team and Ray Farmer has not done enough in his limited time as general manager to prove to owner Jimmy Haslam he deserves more time to put this team together. Even Haslam may not be the best owner for this franchise and that really says something about just exactly how bad it is in Cleveland. This team needs to put together a couple of solid draft classes in the next couple of seasons before I can consider them a team ready to challenge for a playoff berth. Random Thoughts: It’s semi-disappointing we gave up any sort of lead to the Browns. Cleveland’s early 7-0 lead didn’t last and that didn’t surprise anyone. The mood inside the stadium was still one of unwavering confidence that we would get the job done… For the most part I am not the type of person that boos opposing fans but seeing the few Cleveland Browns fans in the stadium, you couldn’t help but feel sorry for them and their fandom. I would be more inclined to hug a Browns fan instead of boo them, just because of all the pain and suffering they have endured throughout their lives… It was nice to see Michael Sinclair raise the 12 Flag. I thought Sinclair would be big enough of a name to raise the flag on alumni day (the home opener) the past couple of years but I guess not. His presence at the stadium today brought back great memories of him, Cortez Kennedy, and Chad Brown along the defensive line in the late 1990’s… One more home game next week before the long 8 month break before the 2016 preseason. Unless of course the Seahawks somehow get to host the NFC Championship Game for the third straight year. What’s Next: The number one game in my #10for10 series will be published on Christmas Eve. Look out for my preview of next week’s game against the St. Louis Rams on Saturday morning. I hope all of you have a very Merry Christmas. Go Seahawks! The Cleveland Browns are one of three NFL teams I have never seen play live. After Sunday that number decreases to two. On Sunday the Browns visit Seattle for the first time since 2003 when they take on the Seahawks. Talk about a tale of two teams. The Seahawks are soaring, sitting at 8-5 on the season and are currently on a 4-game winning streak. The Browns on the other hand are 3-10 and are one of a small handful of teams vying for the number one overall pick in the 2016 NFL Draft. The all-time series between these teams is 11-6 in favor of the Seahawks. This record includes the seasons prior to the Browns being reborn as an expansion franchise in 1999. Our last meeting with Cleveland in 2011 remains one of the hardest Seahawks games I have ever watched. With Charlie Whitehurst making only his third career start at quarterback, the Seahawks were inept at moving the ball on offense. Amazingly Cleveland was not much better yet they edged the Seahawks by a score of 6-3. Here is what I will be watching for in this week’s game. Of course the number one question everyone has been asking the past few days is “who is going to start at running back?” There are more questions that still need to be answered however. What kind of split will our offense have in regards to running vs. passing? Will Russell Wilson take more initiative trying to move the ball on the ground? Are we going to abandon the run altogether? I am going to try my best to answer these questions right now. I would not be surprised to see Fred Jackson start at running back and see the majority of the work especially since the Seahawks released DuJuan Harris earlier this week. Christine Michael, who was cut by the Seahawks and spent limited time with the Dallas Cowboys and Washington Redskins this season, was re-signed on Wednesday. Bryce Brown was also re-signed after a cup of coffee with the team earlier in the year but has a limited understanding of our playbook. Both Michael and Brown have had issues fumbling the ball over the course of their careers so they may be on an equally short leash. As far as our offensive balance goes I think we will stick to establishing the run early on. If the running back, whoever it may be, struggles to move the ball efficiently I think we could see Russell Wilson throwing way more than we are accustomed to. Read option is a possibility but Cleveland is an opponent that can be beat without having to use read option a lot. I think the threat of read-option keepers by Wilson are best kept hidden until January. The only way the Seahawks would abandon the run entirely is if we are trailing late in the game when we would be forced to throw the ball. Let’s talk about the Cleveland Browns offense. This is a squad that ranks in bottom three rushing units in all of football but are ranked 11th in passing yards per game, mainly because they trail in all their games and are forced to throw the ball. After gaining the starting job then losing it due to off-the-field troubles, the Browns will once again start second year quarterback Johnny Manziel. Manziel has focused on making more conservative passes and his completion percentages of 73.3 and 67.7 percent the past two weeks respectively speak towards this notion. Because of this he does not throw many interceptions (3 total this season). Travis Benjamin is Cleveland’s bang-or-bust weapon down the field and he leads all Browns receivers in targets the past two weeks with 18. My focus will be on the Browns most consistent receiver. My X-Factor Player to Watch for the Cleveland Browns is tight end Gary Barnidge. Barnidge signed a lucrative three-year contract extension last week and he is well deserving of it. Barnidge is no doubt a game changer and has been one of the lone bright spots on a porous Browns team. He leads the team with 901 receiving yards and 8 touchdowns. Barnidge will see his share of receptions this week and given the Seahawks struggles with tight ends there is potential for him to have yet another big day on Sunday. The Browns defense ranks near the bottom of the league in yards allowed per game but they feature some talented players. Their defensive line is led by defensive end Desmond Bryant but keep an eye on rookie nose tackle Danny Shelton who will have a big impact in shutting down the Seahawks running game. Veteran linebackers Paul Kruger and Karlos Dansby lead the second level of the defense. The secondary is a unit that has big play potential but they have been unable to stay healthy as a unit. Cornerback Joe Haden is on injured reserve and will miss the rest of the season after suffering a concussion in week 8. Justin Gilbert, the 8th overall pick by the Browns a season ago, has become irrelevant and if you asked Browns fans they might tell you he is not even worth a roster spot. With former Packer Tramon Williams leading the defense with 9 passes defensed and third on the team in tackles with 47, it will be up to left corner Charles Gaines to have a big game because it is likely Russell Wilson will test him often. This week could be a huge week for the 12’s. Johnny Manziel has never played at CenturyLink Field and I have a strange feeling in my gut that he is the most likely quarterback to fail miserably at handling our crowd noise in recent years. I have never made a prediction as to how many false starts the opposing team will have but I strongly believe the Browns will have at least 5 false start penalties on Sunday, which would be the most of any opposing team in 2015. Random Thoughts: The Seahawks will go all college navy at home. No surprise there. The Browns redesigned their uniforms over the offseason and they now have three different jersey, pant, and sock colors (white, brown, and orange). This week they will go with a clean look: White jerseys, white pants, and brown socks… For the second straight week Thom Brennaman, Charles Davis, and Tony Siragusa are on the FOX broadcast. I hope fans sitting close to the field give Siragusa a hard time about the whole “Russell Williams” incident last week. He’ll be sure to say his name right this week. Wouldn’t be surprised if he brings it up on the broadcast either… Gene Steratore is the referee… I’m taking a friend of mine to the game who I went to school with but currently lives in San Francisco. He is driving home and is currently on the road as we speak. Hopefully he’s not too tired for a full day down at the stadium tomorrow… 1:05pm start this week so for those attending make sure you make it into the stadium a little earlier than normal… My goal was to have my Christmas shopping done and my presents wrapped by the time this game rolled around. Mission accomplished. Seahawks Playoff Outlook: There are numerous scenarios that involve the Seahawks clinching a playoff spot this week. The easiest of which I will discuss here. With the Rams win over Tampa Bay on Thursday night, the Seahawks can clinch a playoff spot with a win AND a loss by either the New York Giants or Washington Redskins. With a win Seattle will also maintain the #5 seed in the NFC playoffs. The Seahawks fall to the #6 seed if they lose and the Minnesota Vikings win. The Arizona Cardinals clinch the NFC West with a win over Philadelphia Sunday night or if the Seahawks lose. Here are the games to keep track of. Teams to note are bolded. Prediction: This game is going to get ugly fast. Russell Wilson will throw 4 touchdown passes and Christine Michael will also run for a touchdown. The Browns only score will come in garbage time when Johnny Manziel hits Travis Benjamin for a touchdown. The Seahawks will clinch a playoff spot by the end of the day and we will head into the Christmas week with a 9-5 record. As far as the game goes it went as well as anyone would have wanted. But even though the Seahawks went into Baltimore and beat the Ravens 35-6 on Sunday, Seattle is now facing a bit of uncertainty going forward due to the injuries of key players on both the offensive and defensive sides of the ball. For now however the Seahawks improve to 8-5 and take over the #5 seed in the NFC. The Ravens fall to 4-9 and guarantee their first losing season since 2007. Here are my thoughts following today’s win. Wilson, Baldwin Fuel Offense: After a slow start Doug Baldwin came out and had a huge day for the third straight week. Baldwin caught 6 passes for 86 yards, half of them being touchdowns. I am impressed the Seahawks and Russell Wilson found different ways to get Baldwin open. Given the success Baldwin had had the previous two weeks it was certainly going to be priority number one for the Ravens defense to shut him down. If there was any question going into this game I feel extremely confident now saying Baldwin is Wilson’s go-to guy. Not to be outdone, Wilson had himself a game as well. In addition to his three touchdowns to Baldwin, Wilson also threw two touchdown passes to Tyler Lockett who led the team in receiving yards with 104. Over the past four weeks Wilson has thrown for a whopping 1,171 yards, 16 touchdowns, and no interceptions. This is clearly the best four-game stretch of his career and with two straight home games coming up next this is a perfect opportunity to pad those numbers. Defense Stands Tall: There were brief times when it was almost sickening how efficient Ravens quarterback Jimmy Clausen was moving the ball against the Seattle defense in big chunks, specifically at the end of the first half. When you look at the scoreboard and stat board however the day our defense had against Clausen tells a different story. Our defense did not allow a touchdown for the second straight week, we held Baltimore to 27 percent effectiveness on third down, and we won the turnover battle 2-1. This game was a textbook example of what a good pass rush can do for a team. Even though the Seahawks did not sack Clausen when we were able to penetrate the offensive line Clausen’s throws were off target and oftentimes incomplete. For the Seahawks to give up a combined 13 points in two straight games on the road that is a number that we should be proud of. Injury Outlook: Three starters got banged up on Sunday, each one varying in severity. Michael Bennett jammed his toe late in the game but is expected to be fine. Kam Chancellor injured his tailbone early in the game and head coach Pete Carroll said in his postgame press conference he hopes Chancellor can bounce back and be ready for Cleveland next week. The most crushing blow comes in the offensive backfield. After gaining 44 yards on the first offensive drive Thomas Rawls appeared to injure his knee on a 2nd and 1 play deep inside Ravens territory. He was able to walk off the field gingerly under his own power which appeared to be a good sign. After the game however that good sign turned grave. Thomas Rawls broke his ankle on that play and he will be out for the rest of the season. This is a huge blow for an offense that shined ever so bright with Rawls carrying the ball. Losing a potential offensive rookie of the year candidate is burdensome but what pours even more salt into the wound is the fact the Marshawn Lynch will not be ready to return next week. It surprised me the Seahawks did not use a heavy dose of read-option in the second half but moving forward we may be forced to use Russell Wilson’s legs in the running game more than offensive coordinator Darrell Bevell would probably like to. Thoughts on Harris: Barring a waiver wire pickup/plug n’ start next week against Cleveland, DuJuan Harris will likely see the bulk of the work load moving forward. This worries me immensely. After watching him work (and fumble on his 5th carry of the game) on Sunday I see a guy that does not come close to either Lynch or Rawls. The fact that Harris could not even outgain Rawls’s production on his only drive of the game speaks for itself. All it took was one play to formulate an opinion on Harris. On a 2nd and 6 in the third quarter Harris received the handoff from Wilson and cut left, running into Ravens linebacker Courtney Upshaw and gaining only one yard. If he had cut to the right Harris would have easily had a first down and possibly a little bit more. Harris uses all of his energy when he receives the handoff and has a difficult time reading his blocks. His largest run of the game was a 6-yard scamper on our first drive of the second half. His fumble also has me worried about his ball security because the way he carries the ball it moves up and down quite a bit. Let’s just hope Beast Mode can be back sooner rather than later. Random Thoughts: The Ravens went with purple jerseys and black pants. I like that look much better than the purple jersey/white pants look. It’s more intimidating… Although the broadcast wasn’t as biased as I thought it may have been, it still was hard to listen to. There were several instances where they butchered the names of different players. For example, Ravens wide receiver Kamar Aiken was called “Kamar Aikman” multiple times by commentator Charles Davis. Also at the top of the broadcast sideline reporter Tony Siragusa called Russell Wilson “Russell Williams.” THAT one is inexcusable… Lots of 12’s in Baltimore but the broadcast tried to make the claim that they were pretty much all bandwagoners. I bet there were some but they do not understand just how many Seattle residents travel to our road games. I bet the majority of them were actually from Seattle. What’s Next: The number two game of my #10for10 series will be published on Thursday. Look for my preview of next week’s game against the Cleveland Browns on Saturday morning. The Seahawks begin the month of November at home this week as they renew their old AFC West rivalry, hosting the Oakland Raiders. The Seahawks are 4-3 and are coming off a crucial win in Carolina last week. The Raiders have had a very lackluster season thus far and they are the only winless team left in the National Football League at 0-7. Last week the Raiders fell on the road to the Cleveland Browns 23-13. Oakland leads the all-time series with Seattle 29-24. In their last regular season meeting the Raiders demolished the Seahawks 33-3 in October 2010. That was head coach Pete Carroll’s first season in Seattle and since losing to the Raiders in 2010 the Seahawks hold a .606 winning percentage. Meanwhile in the exact same span, the Raiders winning percentage is a mere .317. Here are some things I will be looking for out of the Seahawks this week, as well as a special report on the Oakland Raiders. I have pleaded for the Seahawks to get quarterback Russell Wilson more involved in the running game the past couple of weeks but this week I do not think it will be necessary for Wilson to run for the Seahawks offense to be effective. Instead, this may finally be the week that we see Wilson spread the ball around and get rookies Paul Richardson and Kevin Norwood their most action of the season. Richardson and Norwood combined for 5 targets last week. Both Wilson and Coach Carroll have stated that they hope to get both of these receivers more involved this week, but I am interested to see if they use them to accentuate their specific abilities. Could Richardson be used on fly sweeps and bubble screens much like how Percy Harvin was used? I think it is definitely possible. Could we see Wilson try to stretch the field and let Norwood use his size as an advantage to catch deep balls? I think Wilson may look Norwood’s direction deep at least once this week. If these two receivers combine for 75 or more receiving yards I think the Seahawks are in for a very successful day through the air. At the end of last week’s game the Seahawks dialed up the pressure on Carolina quarterback Cam Newton and it worked like a charm in preserving the victory. This week the Seahawks defense needs to stick to that blueprint. 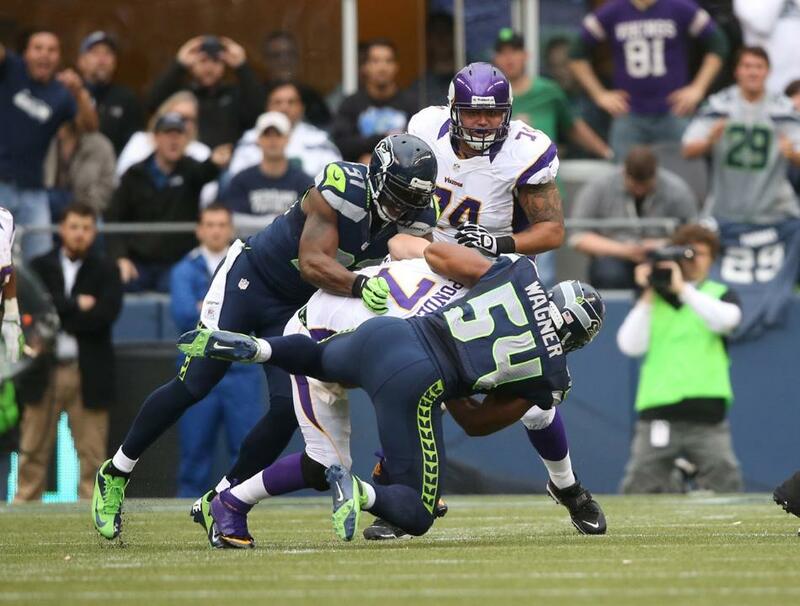 At home in 2014 the Seahawks have averaged just over 1.5 sacks per game. This number must improve. After three home games last season the Seahawks averaged just above 2.5 sacks per game. Expect to see Bruce Irvin and K.J. Wright blitz on early downs this week and keep an eye on Wright who will be back starting at outside linebacker. If Raiders rookie quarterback Derek Carr has time inside the pocket it will be interesting to see how his reads progress in the middle of the field. The Seahawks will start rookie Brock Coyle at middle linebacker this week, who has seen little playing time on defense this season. Coyle is a solid tackler who tries to get in on every play but he has a long way to go to challenge for Bobby Wagner’s permanent starting job. It is not unreasonable to think Carr will try to throw short passes in the middle of the field to test Coyle and if Carr can catch the Seahawks off-guard, those passes could turn into large chunks of yards for the Raiders. There is one major thing the Seahawks absolutely cannot do this week; overlook the Raiders. The Raiders may be 0-7, they may be the worst team in the NFL on paper, but there may be potential for this being a trap game. Remember what happened when the winless Tampa Bay Buccaneers came into CenturyLink Field last season? The 12th Man thought we would just roll right over them. Instead, the Buccaneers jumped out to a stunning 21-0 lead putting all Seahawks fans on edge. The Seahawks cannot play relaxed this week and the fans must be just as loud and intense this week as our other games this season. The Raiders have only lost two games so far this season by more than two scores, including two close games against AFC powers New England and San Diego. Oakland will absolutely get up for this week’s game, the question is will the Seahawks force them to sit right back down or will Oakland be able to put up a legitimate fight. At 0-7, the Oakland Raiders head to Seattle in the midst of a 13 game losing streak and an all but assured 11th consecutive non-winning season. A trip to the Clink sure doesn’t seem to be the solution to the Raiders’ woes. After two years of salary cap hell, Oakland brought in proven winners and recognizable (albeit past-their prime) names – guys like defensive ends Justin Tuck and LaMarr Woodley, and running back Maurice Jones-Drew – but have yet to see a return on their investment. With 13 new starters on both sides of the ball, this group has failed to mesh, costing head coach Dennis Allen his job and leaving general manager Reggie McKenzie’s future beyond this season in doubt. The O in Oakland has gone missing so far in 2014. The Raiders offense is putting up a meager 15.0 PPG, which is good for 31st in the league. Many of these struggles can be traced to an unwillingness to run the ball. Oakland is averaging only 69.6 rushing yards per game, which should be attributed more play-calling than ineffectiveness. Despite Darren McFadden’s respectable 4.0 yards per carry, Oakland passes 67% of the time. On a team with no playmakers at the skill positions (save for the occasional Andre Holmes highlight), passing the ball at such a high rate is a recipe for losing. Rookies Derek Carr (leads all rookie QBs in passing yards, TDs, and QB Rating) & Gabe Jackson (7 starts on a top 5 pass blocking offensive line) along with the aforementioned Holmes are bright spots for the team’s future. The coaching staff may trust Carr with the keys to the offense, but Oakland will continue to stall without a commitment to the run. Things don’t get much better on the other side of the ball. Oakland is near the bottom of the league in nearly every defensive category. They can’t stop the run (130.1 YPG) or get after the QB (7 sacks, tied for 29th). With all of the money McKenzie gave to Tuck, Woodley, and Antonio Smith, it is very disappointing to see such a lack of production. The lone bright spot on this defense is that number 5 overall pick Khalil Mack has lived up to his high draft so far, but not necessarily as expected. Coming out of the University of Buffalo, Mack was known being a disruptive force behind the line of scrimmage. Though Mack has yet to register a sack, he has been credited with 22 QB pressures and is Pro Football Focus’ highest rated linebacker against the run, with 8.5 tackles for a loss. 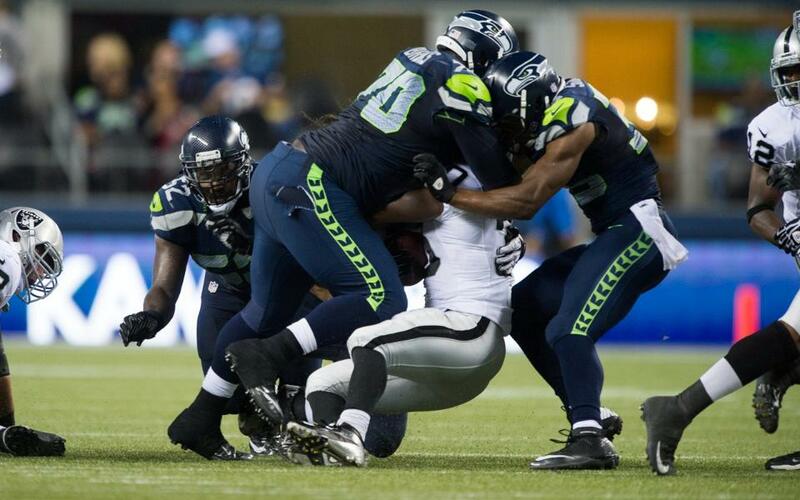 It will be interesting to see if Mack can down Marshawn Lynch in the backfield. With the offense struggling, the Raiders defense has to get off the field more; Oakland is tied for last in the league on 3rd down, giving up a 48% conversion rate. The Raiders have to find a way to pressure Russell Wilson without losing containment, a task that is much easier said than done. Whether it’s “Play like Carcass for Marcus [Mariota]” or (my preference) “Down the Pooper for [Amari] Cooper”, Raiders fans are looking forward to May’s draft earlier than ever before. A win in Seattle would do wonders for Reggie McKenzie’s future as head of football decisions. Is it likely? No. But, rest assured, Sunday is going to feel like a good old fashioned AFC West showdown. Random Thoughts: The Seahawks will wear navy jerseys and navy pants this week. Oakland will sport their classic white jersey/silver pants combo… Kevin Harlan will provide the play-by-play and former Raiders quarterback Rich Gannon will provide the color commentary for CBS this week… Ed Hochuli and his gigantic biceps will do the officiating this week… This will be the first “cold” home game of the season. I recommend sweatshirts and jeans… Two reminders for the 12’s this week. First remember this weekend is daylight savings time. Turn your clocks back one hour and get an extra hour of sleep. Second, remember this week is a 1:25pm kickoff. Give yourself a little extra time to get to the stadium but shame on you if you are not in your seats by kickoff… Given the circumstances of this special Raiders/Seahawks regular season matchup, we have a full slate ahead of us on Sunday. Tentative schedule includes McDonald’s breakfast, being at the bar around the time they open between 8 and 8:30, the game, then dinner at Buffalo Wild Wings. It’s going to be a great day… Walter Jones will become the 11th Seahawk to be inducted into the Seahawks Ring of Honor. The ceremony will take place at halftime. What is interesting is that Jones will be the first player to have his number retired BEFORE having his name put in the Ring of Honor. This is the first Ring of Honor ceremony I will get to be a part of since I became a season ticket holder in 2006 (Cortez Kennedy Was inducted into the Ring of Honor in 2006 but I was unable to attend the game). This season the Seahawks have had a pattern of having a 12th Man Flag raiser that is somehow associated to the opposing team or opposing city. With the Raiders in town I expect a former Seahawk from the 1980’s to raise the flag this week. I have no specific guess though… With a win the Seahawks will close out the first half of the season with a 5-3 record. Prediction: Honestly, I see the Seahawks rolling in this game. Oakland may be able to keep it close in the first half but Seattle will eventually run away with this game. Marshawn Lynch will run for over 100 yards and a touchdown. Russell Wilson will add two passing touchdowns and the Seahawks defense will force 3 Raiders turnovers. The Seahawks will get to 5-3 and we will get ready to face the New York Giants next week. After failing to clinch the NFC West last week the Seahawks will have another chance to get the job done this week as they take on the New York Giants. The Seahawks are 11-2 while the Giants have struggled throughout this season. The Giants have a 5-8 record and with their loss last week to the San Diego Chargers, New York has been mathematically eliminated from playoff contention. The Giants lead the all-time series with the Seahawks 9-6 but it was Seattle who was on the winning end of their last meeting; a 36-25 Seahawks victory over the eventual world champion Giants in New Jersey in 2011. Traveling across the country and playing in the 10am Pacific Time slot is always a difficult challenge for the Seahawks but the motivation of coming off a loss last week makes this Seahawks team a group no team would like to get in the way of. In order to take care of business this week this is what the Seahawks need to do, as well as what the Giants need to do in order to upset this Seattle team. Playing sound defensive football, especially after allowing 19 points in a losing effort last week is the first thing I need to see out of the Seahawks this week. Earl Thomas made it known after last week’s game that the entire team felt angry because they let that game get away from them so I would expect the Seahawks defense to come out completely motivated and they will look to make big plays early. It may be hard for Eli Manning to make deep throws because of the Legion of Boom likely looking to take their anger out by playing a phenomenal game this week. My main focus is something that has been improving on a week-by-week basis and that is the interior pass rush. Eli Manning leads the league in interceptions with 20. The Legion of Boom will make the long passing game hard for Manning this week but if the Seahawks can be consistent rushing the passer this week Manning will surely be forced into making bad throws especially if the Giants are trailing. Brandon Mebane and Clinton McDonald are two Seahawks defenders to watch this week. Mebane is overdue to get involved in the sack department since he has not recorded a sack yet this season, and McDonald was able to make Colin Kaepernick uncomfortable last week, sacking him once. Add effectiveness from Chris Clemons, Cliff Avril, and Bruce Irvin as well and the Seahawks defense will spend a good chunk of game clock on the sidelines while they watch the offense work. Last week against San Francisco Marshawn Lynch ran for 72 yards and a touchdown. Lynch has not run for more than 100 yards in a game since playing Atlanta in week 10 so this week it will be very important to keep feeding the beast. There should be a primary focus this week on the run not just because of Lynch but because of the weather forecast which is calling for potential snow during the game. The Giants defense has been improving each week and their passing defense now ranks in the top half of teams in the league in yards allowed per game. Although we will see Russell Wilson make plays this week I think Marshawn Lynch is due for perhaps his biggest workload of the season this week. A 100-plus yard rushing performance by Lynch could send the Seahawks well on their way to a victory this week. 25-30 carries is the range I expect to see Lynch get against the Giants. Like I stated earlier, Giants quarterback Eli Manning ranks first in the NFL in interceptions thrown and this week poses a daunting challenge for Manning and the New York offense. In order for the Giants offense to be successful against the Seahawks this week I think Manning needs to play similarly to how Colin Kaepernick played the Seahawks last week; by going conservative. Out-routes will be Manning’s best friend this week and I anticipate that he will not try to test the Legion of Boom down the middle of the field, much like the way Kaepernick effectively played last week by throwing along the sidelines. Wide receiver Victor Cruz will be Manning’s most reliable target this week but also keep an eye out for Hakeem Nicks who caught 5 passes for 131 yards against San Diego last week because he may emerge as a dangerous sideline threat this week. The New York Giants defense is a mystery to me as a unit this season. Although they are one of the older, more experienced defenses in the league they still have playoff caliber talent. Mental lapses, ineffectiveness, and injuries have doomed the Giants all season long. The Giants give up an average of 337 yards per game to opposing offenses and in their 8 losses they allow close to 34 points per game, certainly one of the worst averages among all NFL teams. Justin Tuck continues to be the most well-known and most productive defender New York has to offer. Tuck has recorded a team high 8.5 sacks this season but the lack of production by the rest of his defensive teammates allows opposing quarterbacks to stand in the pocket, make throws, and continue drives. 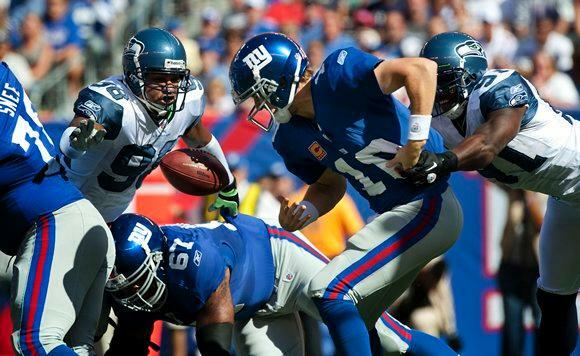 Fundamental tackling and forcing Russell Wilson turnovers will help the Giants prevail with a win this week. Having said this, my X-Factor player to watch for the New York Giants this week is Safety Antrel Rolle. Rolle leads all Giants defenders in tackles with 79; about 6 per game. Rolle has also intercepted 5 passes which also leads all Giants in that category. Rolle has been New York’s best all-around player on defense this week and it will be important for him to tackle smart to prevent big gains of yardage and to fly around in the secondary, similarly to Earl Thomas, in order to confuse Russell Wilson and have a chance to take advantage of any potential Seattle offensive mistakes. Random Thoughts: The Seahawks will wear white jerseys this week. Pant color has become a total crapshoot on the road but if I have to make a prediction, I say we will wear blue pants… The Giants will wear blue jerseys and I would not be surprised to see them wear their new white pants again this week… Kevin Burkhardt and John Lynch will have the call for FOX this week and Erin Andrews will patrol the sidelines. It was just announced this week that the Burkhardt/Lynch/Andrews team has earned the right to call one of two NFC Divisional playoff games on FOX on either January 11th or 12th. Good for this team. I would agree that they deserve this opportunity. I have enjoyed their broadcasts on Seahawks road games this season… Expect all questionable calls to go against the Seahawks this week. That’s right friends you guessed it. The referee for this week’s game is Bill Leavy. You know, the guy who helped prevent us win our first Super Bowl 8 years ago. Yeah. That guy… My cousins are going to be at this weekend’s game. I’m jealous. Oh well, maybe I’ll get the chance to go to the next Seahawks game at MetLife Stadium!… This will be the first game of the season that I get to watch with my best friends/roommates from last year. That will be a lot of fun. Looking forward to it Jake, Alan, and Clayton… I would love to see it snow during this week’s game. Not like the Detroit/Philadelphia game from last week but a light dusting would do for me… It’s really cool to think that if things go as planned in the coming weeks this will be the last Seahawks road trip until Super Bowl XLVIII should we make it. Let’s take care of business this week so we can maintain the wiggle room to clinch sooner rather than later. I do not want to see us lose, essentially thrusting our final two games into must-win games. Seahawks Playoff Outlook: The Seahawks can clinch the NFC West and a first round bye with a win over the Giants and a 49ers loss to Tampa Bay. The Seahawks can clinch the NFC West and home field advantage throughout the playoffs with a win over the Giants, a 49ers loss to Tampa Bay, and a Saints loss to St. Louis. Here are this week’s games to watch that could affect the entire NFC Playoff picture. Teams to note are bolded. Prediction: There is a sense of urgency and the team knows it. They let last week slip away and I believe that this week they will not let the Giants get anything going to start. The Seahawks will build a lead and although New York may make it close, this game will be the Seahawks game to lose. Marshawn Lynch will run for a pair of touchdowns and Kam Chancellor will force a fumble which will be recovered by Bobby Wagner. The Seahawks will win but with a predicted San Francisco win, the Seahawks will have to wait one more week to clinch the NFC West at home against Arizona. Check back late Sunday night/early Monday morning for my Giants review. Thanks for reading and Go Seahawks! After the Seahawks 33-10 win last week over the Atlanta Falcons, they come home this week for one more game before their late bye week. This week also begins a stretch where the Seahawks play 4 out of their last 6 regular season games at home. They start this stretch against the Minnesota Vikings. The Seahawks continue their best start in franchise history as they enter this week’s game with a 9-1 record. Minnesota has not had similar fortune. After going 10-6 and making the playoffs last season, the Vikings enter this game at 2-7 and are in last place in the NFC North. Having said this, the Vikings are coming off of a win last Thursday night as they defeated the Washington Redskins 34-27. The Seahawks lead the all-time series with Minnesota 7-5. Their last meeting came last November. After allowing 80 rushing yards and a touchdown to running back Adrian Peterson on Minnesota’s first offensive drive of the game, the Seahawks buckled down and beat the Vikings 30-20. Two weeks ago many including myself thought the Seahawks would easily beat Tampa Bay at home but barely squeaked by with a win. The Seahawks cannot overlook the Vikings like they overlooked the Buccaneers. Here is what needs to happen for the Seahawks to get to 10-1 on the season. As always I start with the Seahawks offense and the biggest key for Russell Wilson and the rest of the offense this week is to carry their offensive momentum from last week’s game into this week’s game. On paper that should not be a problem. The Seahawks will have Russell Okung, Max Unger, and Breno Giacomini back this week starting on the offensive line. This is great news for Marshawn Lynch. If you think he was productive the last few weeks with a makeshift offensive line, just imagine how productive he will be going forward with our starting line back. This is also great news for Wilson, as the pass protection should improve greatly, giving him more time in the pocket to make throws down the field. It also helps that the Vikings pass defense ranks 5th worst in the NFL, allowing an average of 286 passing yards per game. I think it may take a little bit of time for Wilson to get re-acclimated to his starting offensive line, thus you may see him panic and make quick throws to his receivers early on. If pass protection is strong early, Wilson will settle down fast and be able to confidently stand in the pocket to make throws as the game goes on. At the other skill positions the primary storyline this week is the return and Seahawks debut of wide receiver Percy Harvin. According to the NFL Network, Harvin is expected to start this week. As exciting as it is to have Harvin back in the lineup, he has not played in a live game for a full calendar year and he must get back to game speed and it may take some time to do so. Harvin will play but I do not expect to see the kind of jaw dropping performance this week that Seahawks fans knew they were getting when we acquired him. I do not expect Harvin to return kicks and he may be on a limited snap count this week. In my opinion I expect to see Harvin on the field between 12 to 15 plays and I would be satisfied to see him catch between 40-55 yards worth of passes. Adding Harvin could also benefit the passing game by using him as a decoy. Golden Tate has put together a solid string of performances over the past couple of weeks and Jermaine Kearse has proven to be Russell Wilson’s go-to guy deep down the field. The different ways Pete Carroll and Darrell Bevell use our wide receivers create different options for how to play Harvin both on the outside and in the slot. In short, Percy Harvin will make an impact in our offense this week, the question is what kind and how big of an impact. The number one key for the Seattle defense this week is to prove that last week’s 64 rushing yards allowed to the Atlanta Falcons was not a “fluke” performance. The run defense will face their biggest challenge this week and it will be essential to shut Adrian Peterson down and force Minnesota to throw. Mistakes could be made by the Vikings if the Seahawks can effectively take away the running game, and the Legion of Boom should be on high alert for passes dangerously thrown into coverage. 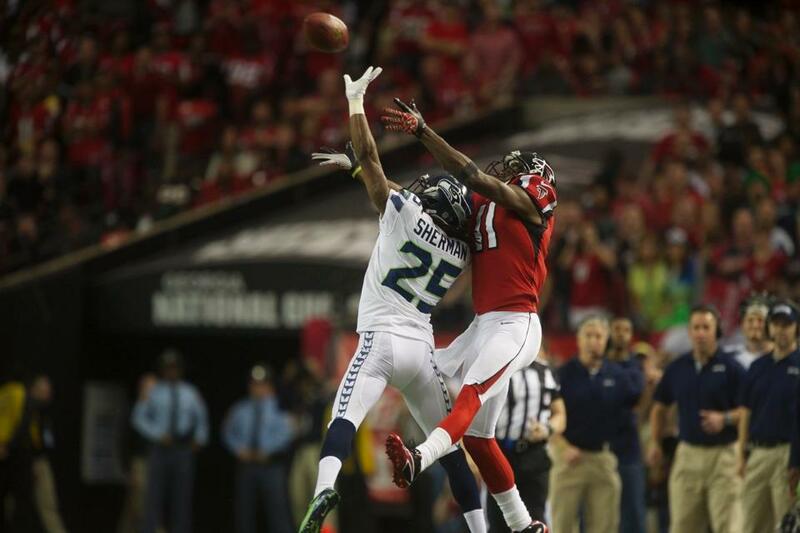 Speaking of the Legion of Boom, I am curious to see Walter Thurmond start in place of the injured Brandon Browner. If there is one position group that can afford to lose a starter it is cornerback. Thurmond started for Browner in the Seahawks first two games of the season and had 5 tackles and 2 passes defensed in that span. With Thurmond starting and Jeremy Lane nursing an injured hip, Byron Maxwell might be forced to play nickel corner this week. If this is the case, expect the Vikings to have three or more receivers on the field more often to try to take advantage of our defensive formations. There is no secret to how the Minnesota Vikings offense works; give the ball to Adrian Peterson and let him run wild. With the Vikings quarterback situation up in arms (Christian Ponder is expected to start Sunday with Josh Freeman and Matt Cassel as backups) the only way I think the Vikings can win this game is for Peterson to carry the team on his back, putting up a couple hundred rushing yards and scoring multiple touchdowns. Peterson deserves the bulk of the offensive workload no question about it but there is another guy on Minnesota’s offense that deserves to be my X-Factor player to watch this week. After the Vikings traded Percy Harvin to the Seahawks over the offseason, they needed to plug that hole and try to replace Harvin’s production. Minnesota used one of their three first round picks to try to do so. My X-Factor player to watch for the Vikings this week is rookie wide receiver/kick returner Cordarrelle Patterson. Patterson is a height/weight/speed player who caught my eye leading up to this year’s draft. Although raw, I thought Patterson would be a good fit in Seattle and although he does not have the prettiest of stats so far this season, the potential is there to confirm my personal pre-draft thoughts. Patterson’s most productive game as a receiver came week 3 against Cleveland when he caught 2 passes for 49 yards. Patterson has not caught more than 3 passes in a game so far this season but the Vikings have done a better job getting him involved in the offense, which was evident last week against Washington when he caught his first career touchdown pass. It will be necessary for the Seahawks to play a solid game on special teams because Patterson is not afraid to return kickoffs deep out of the endzone. Patterson has returned 2 kickoffs for touchdowns this season. Peterson and Patterson will be responsible for the majority of Minnesota’s offensive production this week. Shutting both of them down will go a long way in preserving a Seahawks victory. Random Thoughts: A preview of the Vikings defense does not warrant its own paragraph so I will place them here in random thoughts this week. The Vikings defense has struggled as a unit throughout the course of this season but keep an eye on veteran defensive end Jared Allen and linebacker Chad Greenway. Both have put up good numbers to lead this subpar group this season… Blue jerseys and blue pants once again for the Seahawks this week. The Vikings will most likely wear purple pants with their white jerseys… Chris Myers and Tim Ryan have the call for FOX this week… Jerome Boger is the referee this week. Don’t be surprised if Boger frustrates you at some point during the game. He does not do nearly as good of a job explaining his calls than other referees. In my opinion he is one of the worst referees in the NFL overall… For those attending this game remember that it is a 1:25 kickoff this week. I like having that extra 20 minutes to get to my seats… Gates will open 3 hours before the rest of our home games this season. Hopefully that chops down waiting time when I go in about an hour before kickoff… This week’s game theme is military appreciation. A full-sized American flag will be unraveled during the national anthem along with a Purple Heart ceremony during halftime. Vietnam veteran and Medal of Honor recipient Bruce Crandall will raise the 12th Man Flag this week. It is tradition that a notable local veteran raises the flag on military appreciation day… I will definitely be scoreboard watching throughout the game. Although I don’t want to see either team win, I would rather see New Orleans win than San Francisco. We’ve got to take care of the division first before we can start to think about home field advantage in the playoffs… I am taking a buddy of mine who is a Chicago Bears fan primarily and a Seahawks fan on the side. We’ll have to make sure the Ravens/Bears game is on at the bar during the morning slate of games for his enjoyment. As always let’s take care of the Vikings early and stay healthy! Prediction: The Seahawks will take care of business this week and although we will not dominate like we did against the Falcons, they won’t have us biting our nails in nervously like they had us doing against Tampa Bay two weeks ago. Russell Wilson will throw for 300+ yards and Golden Tate and Doug Baldwin will each have a touchdown catch. Marshawn Lynch will run for at least 85 yards and a touchdown as well. Adrian Peterson will put up two touchdowns on the ground but it won’t nearly be enough as Seattle will win and head into the bye week 10-1. Seahawks Playoff Outlook: Going into this week the Seahawks have a 2 ½ game lead on the San Francisco 49ers for first place in the NFC West. They also lead the New Orleans Saints by 1 ½ games for the number one seed in the NFC Playoffs. Here are this week’s games that could impact the NFC Playoff race overall. Teams to note are bolded. Be sure to check back late Sunday night/early Monday morning for my review of our game against the Minnesota Vikings. Enjoy the game everyone. Go Seahawks! On January 13th in the NFC Divisional playoffs, the Seahawks erased a 27-7 deficit and with 31 seconds remaining in regulation, the Seahawks held a 28-27 lead over the Atlanta Falcons. If they had held Atlanta it would have been the biggest comeback in franchise history and would have carried the Seahawks to the NFC Championship Game. Key words: would have. The Seahawks could not protect 35 yards in less than 30 seconds and the Falcons kicked a game winning field goal to win the game and end Seattle’s season. On Sunday, the Seahawks return to the Georgia Dome to face a 2-6 Falcons team that has arguably been the NFL’s most disappointing team of the 2013 season. The Seahawks are 8-1 and are looking to maintain their NFC West lead and while the Falcons have not mailed their season in just yet, they are looking to play spoiler and try to build some sort or momentum into the weeks ahead. Seattle leads the all-time series with Atlanta 8-6. Here is what you need to watch for this week against the Falcons. Last week at home the Seahawks patchwork offensive line did not allow a sack of quarterback Russell Wilson but the pressure provided by the Tampa Bay Buccaneers defense did flush him out of the pocket on many plays. Two weeks ago against the Rams, Wilson was sacked 7 times. That game was on the road and parallels what Wilson and the offensive line faces again this week. Until Russell Okung and Breno Giacomini come back from their injuries I feel obligated to continually make the Seahawks offensive line and passing game my number one thing to watch on offense, especially in road games. After the pressure patterns that have forced Wilson out of the pocket the past couple of weeks, I believe screen passes must be a focal point of our offensive gameplan against the Falcons. Last week against Tampa Bay Doug Baldwin led all Seahawks receivers with 75 receiving yards and a touchdown. Baldwin must make a big impact again this week. Of passes caught by wide receivers last week, all but one went to three different receivers (Baldwin, Golden Tate, and Jermaine Kearse). Ricardo Lockette and Bryan Walters made no impact in last week’s game and I believe it will be the same story this week in Atlanta. The wild-card this week will be Golden Tate. Tate can catch screen passes while also creating room to run in the open field and he can go up and grab deep passes. If Baldwin is used short and if Kearse is targeted for moderate-length passes, it will be Tate that Atlanta should worry the most about, as he can catch any type of pass that Darrell Bevell calls. “Roddy White? Top 100? No. I just don’t think he’s a top 100 player.” This came from cornerback Richard Sherman during NFL Network’s “Top 100 Players of 2013” countdown during this past offseason. After Sherman’s trash talk going into last year’s Divisional playoff game and after White beat Sherman on a deep 47-yard touchdown early in that game there has been subtle tension between these two players over the past 10 months. Call it a rivalry or call it a competition, this matchup will be the one to keep an eye out for when the Seahawks are on defense. White has not played since October 7th when he injured his hamstring and he believes he will be ready to go this week. With Julio Jones out for the season, White, regardless of his health status, instantly becomes the Falcons number one wide receiver moving forward with Harry Douglas on the opposite side. Although I suggest keeping an eye on Sherman and White, that does not mean I think that is the most important matchup for the Seahawks on defense. The secondary has done a good job shutting down receivers wide and deep the past few weeks and this week should be no different. What hurt us down the stretch of last year’s playoff game could be the same thing that gives the Seahawks defense problems this week; stopping the middle of the field and shutting down Falcons tight end Tony Gonzalez. If Seattle can stop the Atlanta running game to force third downs, Falcons quarterback Matt Ryan likes to throw in Gonzalez’s direction in the middle of the field. A strong performance by Bobby Wagner and K.J. Wright could limit Gonzalez’s effectiveness and will force punts. Man-to-Man coverage and limiting separation for the Falcons wide receivers could be a big ally for the Seahawks this week. Expect a conservative passing game from Ryan this week to prevent throwing into the Legion of Boom. One of the weaknesses of the Seattle defense over the past two weeks has been stopping the run. They’ve given up an average of 202.5 rushing yards per game over this span. That does not bode well against the Falcons as they feature two very talented, yet very different running backs; power back Steven Jackson and the speedy, agile Jacquizz Rodgers. Having said this, the Falcons rank last in the league in rushing yards per game. If the Falcons are competitive and make this a close game, I believe it will be because of Jackson and Rodgers. The difference in running styles could be a disadvantage for a Seahawks defense that tends to gravitate towards making bone-rattling hits instead of fundamental tackling. The potential absence of defense end Red Bryant could also play a factor in the effectiveness of the Falcons running game. On the other hand, the Seahawks have seen Jackson twice a year dating back to 2004 so they understand what it takes to stop him. I believe if the Falcons offense shows they can be productive in the running game early on, they will try to ride Jackson and Rodgers for most of the game. One other thing to note in the Atlanta running game is the way carries are split. In their last two games, Steven Jackson has gotten 77.4 percent of the carries while Jacquizz Rodgers has gotten the remaining 22.6 percent. I think it is safe to expect a more even split-up of carries this week and the hotter hand could wind up seeing more playing time. To start the game however, expect Steven Jackson to get the first chance in the backfield and if he gets off to a cold start, they may hold off on giving Rodgers carries to try to see if they can get Jackson going later on in the first half. The Falcons have added many new faces on defense this season and they feature an interesting mix of veteran leadership and youth in each level of the defense. According to the official Falcons depth chart on their website, their three starting linebackers have 4 years of NFL experience combined, including two rookies. It will be necessary to spotlight how the Falcons use these young linebackers when rushing the passer. Although Atlanta averages only 2 sacks per game they are facing their easiest challenge of the season as they will go up against both Paul McQuistan and Michael Bowie on the left and right sides respectively. My X-Factor player to watch this week for the Falcons is rookie outside linebacker Joplo Bartu. Bartu is tied for 3rd on the team with 2.5 sacks on the season and has also recorded 42 tackles which ranks 2nd on the team. Although veteran pass rushers Osi Umenyiora and Corey Peters have been productive and cannot go unnoticed, Bartu adds a dynamic in the second level of the Atlanta defense that could give both our passing game and running game trouble. Don’t be surprised to see the Falcons use Bartu in blitz formations against Seahawks right tackle Michael Bowie. Whether he blitzes on any given play or not, the confusion that Bartu could potentially create could allow Umenyiora, Peters, or a different Falcons defensive end to beat Bowie off of the line, creating problems for Russell Wilson and the Seattle offense. Random Thoughts: After this game 4 of our remaining 6 games are at home. I may be stating the obvious but that is a huge advantage for us moving forward… Along the same lines (sort of) I am going to one of our remaining two road games so after we play Atlanta I will only watch one more regular season Seahawks game on television… Kevin Burkhardt and John Lynch have the call for FOX this week. The last Seahawks game they broadcasted was our loss to the Indianapolis Colts in week 5. Bad omen? Maybe… Bill Vinovich is the referee this week… My prediction: white jerseys and white pants this week, the same combination we wore in Atlanta in the playoffs last season… It’s sad that Tony Gonzalez came back for one final season to a “contender” but the Falcons season has not gone as they planned. If I were him I would have asked for a trade to a contending team at the trade deadline… This is our first 10am start since losing to the Colts… Only one more 10am kickoff after this game… A win in fantasy football this week would put me at 4-6 and a playoff push could be in my future… The Falcons do something that really annoys me. Try to hear the Georgia Dome PA announcer when the Seahawks offense faces a 3rd down. The announcer says ttttttthhhhhhhhiiiiiiirrrrrrrddddddd down with increasing pitch tone, kind of like a game show announcer if you know what I mean. Hopefully we won’t face many third downs on offense… Go Panthers. Go Cowboys… Once again, here’s the bold prediction I have told my friends and I have posted on the blog before. If we beat Atlanta this week, we will win the NFC West and will be well on our way to home field advantage in the NFC playoffs. Prediction: I hope you guys are back to full health after the heart attacks the Seahawks gave us last week because this week is going to be the exact same story. Over the past couple of seasons there seems to be one game per year that leaves me beyond angry; closer to pissed off. It was our 6-3 loss to the Cleveland Browns in 2011 and our 24-21 loss to the Miami Dolphins in 2012. I get a bad feeling that it could be this game this season. The Falcons will be effective in the running game and I believe we will have significant trouble stopping the Falcons offense on third down. This game will go to overtime and the Falcons will drive down the field on their first possession and score a touchdown. If the Seahawks can win the turnover battle I think we can win but I think the Falcons will find a way to pull this one out. We have played terrible football overall the past two weeks and unfortunately this week on the road is when I think it will finally nip us in the bud. We are the better team. Unfortunately we are not completely healthy and we would definitely win this game if we were completely healthy. Of course I hope I am wrong but with the way Seattle has played the past couple of weeks you need to take a good look in the mirror if you seriously expect the Seahawks beat the Falcons easily this week, especially on the road in a hostile environment. Check back Sunday night for my Seahawks/Falcons review and a quick look at week 11 against the Minnesota Vikings. Enjoy the game and go Seahawks!